The Southern’s Wholesale Members sell over $50 billion a year in our 14-state region (and surrounding states). They all come together once a year at our annual meeting to conduct business, attend education sessions and network with the top manufacturers in the industry. If you have already signed up to be a vendor, go to Confirmed 2019 Vendors section of this page. Guaranteed appointments with buyers during our Ten-2-Profit event. Opportunity to continue conversations at the “House of Deals” event. “Virtual House of Deals” portal featuring pre- and post-event deal offerings to buyers. Pricing designed to encourage families to attend the meeting with you – spouses and children under 18 are FREE. Our vendor partners are family here at the Southern. We have created an environment where business gets done and relationships get strengthened. We hope you will join us in Williamsburg! If you have any questions, please call us at 770-932-3263. Attendee Registration – All confirmed vendors should have received a link to register all of their attendees. All attendees (including spouses and children) need to be registered so that they will have a badge ready for them when they arrive at the meeting in Williamsburg. A badge is needed to attend all events! Hotel Information – The Southern does NOT make your room reservations. Please reserve your rooms directly from the Colonial Williamsburg Lodge by following this link. You can also contact the Lodge directly by calling 1-800-261-9530. 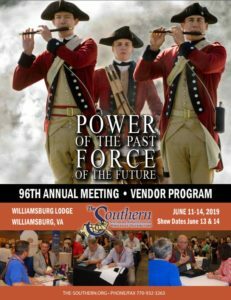 Be sure to tell them you are with the Southern Association of Wholesale Distributors annual meeting in June. Show Deals – Our Virtual Show Deal Portal expands your selling window by making your show deals available to buyers from June 1 to June 30. Vendors utilizing this great tool will have access to review, download and print all orders before arriving at the meeting and throughout the month of June. For those Vendors that are participating, click on the Virtual House of Deals icon to start adding products. If you haven’t signed up yet to participate, contact Maria Miro-Narlock at mmiro-narlock@spotlightinnovations.com. Ten-2-Profit One-On-One Appointments – Remember, the Annual Meeting no longer follows the traditional tradeshow format. All 2019 Confirmed Vendors will be receiving a list of our Southern wholesale buyers on or before May 15th for ranking the order in which you would like to meet with them. (Vendors will be provided a list of their appointments on or before May 25th.) Click here to access information on how to plan for this important event on Thursday, June 13th. House of Deals – The 2nd Vendor Event is the House of Deals event on Friday, June 14th. This is where the Vendors will each have a table and 8 ft. banner, provided by the Southern, and the wholesale buyers will move from table to table. If you are a returning vendor, then we already have a banner created for you. If you would like to update it, there will be an additional charge. If you are a new vendor, we will reach out to you for logo or artwork for your 2019 banner. Onsite Vendor Directory – Be on the lookout for an email asking you to provide (or edit existing) Vendor Directory Listing. New Items Kits – New Item Kits are a great way to provide buyers with a sneak peek into the quality, effectiveness, and taste of your products. The exact contents of the kit may vary according to your business, product and/or service, but the result should always be the same – increased awareness, interest, and a boost in upfront sales. At the end of April, you receive a list of Southern’s member buyers along with their mailing addresses. You mail out your kit. If you are participating in the Virtual House of Deals, it opens to all buyers on June 1st. Let the ordering begin!